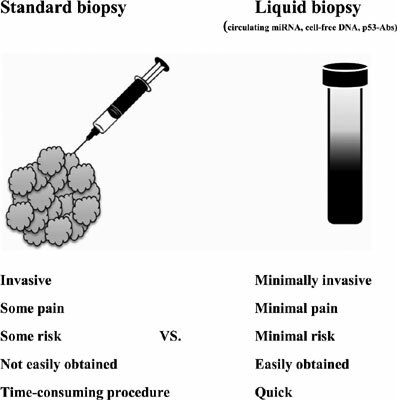 Background: Liquid biopsy is a minimally invasive detection method for molecular biomarkers such as miRNA and cell free DNA in body fluids. Deregulations of miRNA are involved in papillary thyroid carcinoma (PTC), one the most common endocrine malignancy. The most widespread common mutations detected in papillary thyroid cancers are BRAF mutations. Many studies indicate that the BRAF mutation is related to deregulation of miRNA. p53 has an important role in cell cycle control, DNA repair and apoptosis. Moreover, the p53 can regulate the expression of miRNAs and thus participate in thyroid oncogenesis. Objective: In this review, we briefly summarize the present state of knowledge about miRNA, BRAF and p53 mutation in the development of PTC and the possibility of using detecting BRAF mutation and miRNA expression in liquid biopsy. Results: The use of the plasma miRNA expression profile in combination with the BRAF mutation analysis in cf-DNA may be a valuable tool in management of PTC. Conclusion: Numerous molecular variation characterize recent diagnostic and prognostic markers and therapeutic targets for this type of cancer, which offer unique chances for further research and clinical development of innovative treatment strategies for thyroid cancer. miRNA, papillary thyroid cancer, liquid biopsy, BRAF mutation, MAPK pathway, tumor protein p53, cf-DNA.